As it's something that young learners can easily apply to the world around them, the family can be a fun and rewarding lesson theme. This lesson plan includes a lead-in activity, several ESL classroom activities, a game and a collection of specially selected ESL resources from around the web. Tell your students that you are going to draw your family tree on the board. Then, build out the family tree to introduce the target language. If you can, lean on L1 to reinforce your students' understanding of the new vocabulary and teach a few simple questions. e.g. "Who is my ___?" For this speaking activity, you'll query the class on your family tree. This challenging and interactive ESL activity will test the children's retention of family vocabulary and demonstrate a functional use for personal pronouns and some basic question words. This activity is a follow-on activity on from the sample board included in this lesson. However, you can still do it if you have another example of a family tree to show your students. How many cousins has Philip got? How many uncles has Eamon got? How many sisters has Brian got? How many children have Jane and Phil got? It's the students' turn to create a family tree. In the following activity, ESL students are challenged to apply what they've learned to their own family. Have the students draw their family tree. You can test their understanding by asking questions while they work. 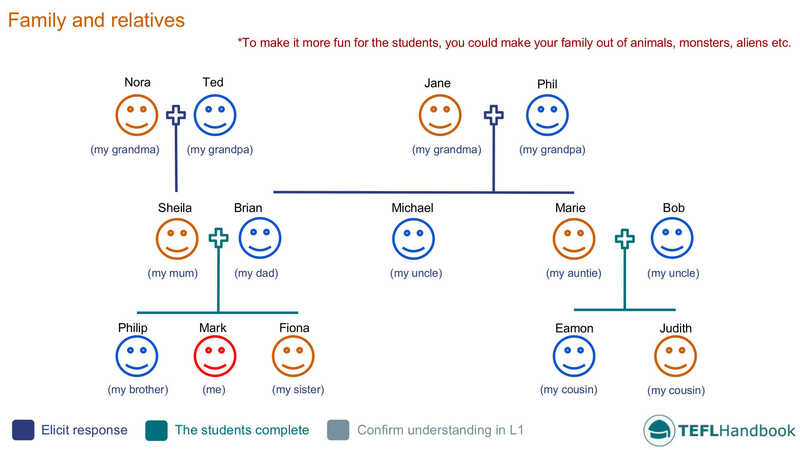 In this speaking activity, the students will now quiz each other on their family trees. Divide the students into groups of two or three. They will then ask each other questions about their family trees. It might be a good idea to put some sample questions on the board to help them. 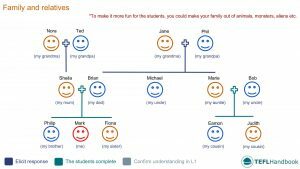 Use the examples from the 'family questions' activity as a guide. Monitor the students carefully and correct any mistakes you hear. The students arrange themselves into a family tree and answer questions. Start by telling the class to arrange themselves into a family tree. You should assist with this part to speed things up. Once they are all in position, start asking individual students questions about the family tree. Use the examples from the 'family questions' activity as a guide. Students earn a point for a correct answer and the teacher scores for incorrect answers. The British Council have a great family and friends lesson plan, that's full of ideas. BusyTeacher.org's article '10 ways to teach about family' has some excellent ideas for activities that you can adapt into your ESL lesson plans. Islcollective have a collection of free printable worksheets that can be used to teach the family. The Lotta's Family tree worksheet would serve as a useful revision of everything covered in this lesson. Our suggested next lesson is on Possessive adjectives. Be sure to check out our full list of ESL lesson plans for beginners (A1 Mid-level), as well as our complete selection of EFL - ESL lesson plans. If you own a mobile device, have a look at the TEFL Handbook app. An ESL lesson planner for English teachers. It has a lot more content and gives you faster access to our ESL resources, making it easier to use in class.